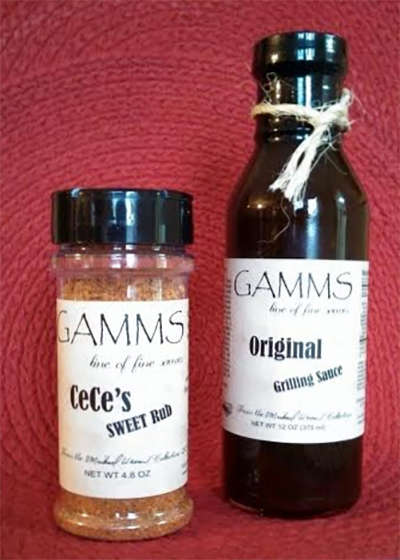 What our customers say about GAMMS fine sauces and marinades. This is a good sauce in a tough market. Give it a try, you won’t be disappointed. Had the pleasure of meeting these fine folks Friday evening and sampling the sauce. Threw it in the crock-pot with country style ribs last night and they were the best ever! I will say that I have been using this sauce and rub for about two months and it is great. We injected our turkey and rubbed EVOO and the dry rub on top and it came out excellent. We have also made our own hot chips using the dry rub. other items we have made include nachos with a dry rub dip that included sour cream, cream cheese, and mayo. i would recommend to anyone looking for a new taste. you may also like seasoned beef for tacos and GAMMS sauce mixed in with it. Great lunch today! (Yes, I actually cooked. Shocking, I know.) Thank you Gamms line of fine sauces (Greg Warren) for our wonderful chicken. Next time Barry is gonna grill it! Mmmm! Great family, even better sauce! There are many different sauces on the market and from a chef’s point of view this has to be the best I have EVER tried and I trust me I have tried hundreds. Gamms sauce blew me away! I tried a sample on some pork at the “Got to be NC festival” purchased a bottle, took it home and made Sheppard’s pie, it was a HIT, this sauce goes great on any food item. To all my fellow chef’s out there get this sauce! It will turn you meats and vegetables to award winning dishes! I bought the dry rub at the NC Festival and what a great product this is. I have used it on ribs, pork chops, burgers, steaks and it makes the absolute best meals ever. I recommend everybody to try it. It will certainly make your favorite meal better. I used your marinade own four different racks of ribs and had great reviews for what they thought was my mix. I love it and so does everyone that comes to my BBQ. I am now out of the only bottle i need after my wife cooked ribs tonight. I want more and will order more for the right price. Oh my goodness!!! I had to run into my neighbor at the Holiday market in Greensboro,NC. to get a couple of bottles of this “magic potion”!!! My son Jasper, well known chef in my house! used it on his first deer currently in my freezer. Some of the best venison I’ve ever eaten due to the results of adding GAMMS dry rub. We used it tonight on pork chops….heavenly! BEST pork chops EVER! I will be buying this stuff for Christmas presents! He told me I’d be back for more …and he was RIGHT!!! Thanks Greg Warren ! I sell kettle corn and was at the Park Expo in Charlotte when we traded some corn for your rub and sauces. I have just order more on line great products. I cook a lot and take great pride in coming up with my own rubs and sauces. But when you can buy already made this good why bother. We need you in stores in Charlotte. I met the family at the NC festival and tried the dry rub, loved it and bought it that day. Took it home and used it on my chicken breast before grilling, the whole family fell in love. Ordered more that night, along with the sweet rub. I am trying that for the first time tonight, very excited!! Greg, I met you this past weekend at the chocolate and wine festival on Saturday, we talked about smokers and how you made one. Anyways just wanted to say that I have spent the past few years searching for the perfect rub and or marinate, tinkering with my own concoctions buying spices from all around the US. However last night for the super bowl I got off work late and I decided I wanted to try your rub so I swung by Harris Teeter and picked up some brew and chicken drumsticks and called up my buddy’s and had a little last minute impromptu Super Bowl party. I layered the rub on the chicken then put them in the oven at 425 for 45 minutes after about 20 minutes I basted on your marinate. WOW if your rub and marinate isn’t the best ones in the US. Y’all have the best product I have ever seen and your customer service has made me a customer for life. Not only that I will be spreading the word. Best of luck with your future endeavors you guys have a product that can make it big time. I cooked a deer roast in the crock pot with this marinade and my husband ate till he about popped. He took the rest of it to work to share with his buddies and they had to have the name of it. Thanks guy, we are looking forward to seeing you again this year in Greensboro NC. I am in love with my Gamms sauce! My family eats Gamms on literally almost everything. My favorite is GAMGAM chicken! This is a must try marinade and grilling sauce; you’ll be glad you did. I’ve been using Gamms now for over a year. Now my family and i have used it on everything from steak to Thanksgiving turkey. A new Southern staple for us. Got some marinade at the State Fair–cant wait to get some more at Piggly Wiggly in Clinton!! Good marinade for tender cuts of venison!! Three years ago, my children gave my husband the grilling sauce for part of his father’s day gift. My husband is a fabulous cook and is very picky on what sauces he uses. We didn’t use it for awhile because he has always preferred his own. That has changed. The next gifting occasion, he got a complete gift set. (as did several other members of my family) We absolutely adore every product. We try very hard NOT to run out. Fantastic family to work with. Great customer service.. You can’t go wrong!! Mannnnnnnnn Let me tell you the truth. I put the sweet rub and grilling sauce on some beef ribs and put them in the crock pot, and I have been semi-obsessing over this product. THEN I came home one day and my Husband made some grilled burgers seasoned with the Gamms sweet rub OH MY LORD…Let me tell you the truth again. We have never cooked the same meal two days in a row, but we did this week! I’m on my way to stock up again! I have over 180 seasonings and rubs in my cabinet, and this rub and sauce is my absolute FAVORITE.